Fortnite: Battle Royale fans are used to keeping track of various objects around the map, such as the large purple cube and earthquakes. But now, there’s something new for players to keep their eyes on—a helicopter. A mysterious helicopter has seemingly been slowly traveling around the map. It now sits on top of a mountain near the race track in the desert biome—but it has also apparently been spotted north of Sunny Steps on top of a mountain, surrounded by a few volcano vents. The military helicopter really sticks out in the current pirate-themed season of Fortnite and could potentially hint toward a few things coming to the game in the future—or nothing at all. Let’s face it, the helicopter sightings could amount to nothing more than Epic Games having a bit of fun. But some fans on social media still feel like this is a sign of either next season’s content or the return of flying vehicles in a future season update. 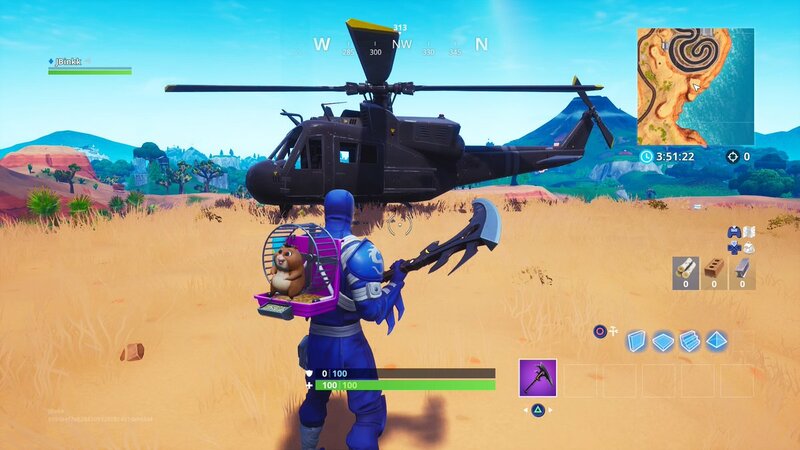 This isn’t the first time that a helicopter has been seen in Fortnite, however. A similar helicopter made an appearance in season four on the film set at Moisty Mire.